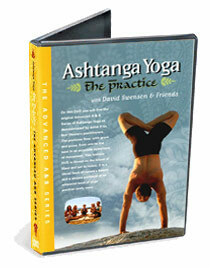 Originally, Ashtanga Yoga was taught in four levels: Primary, Intermediate, Advanced "A" and "B." Today it is taught as six series with Advanced "A" and "B" being series 3-6. This DVD is an historic presentation and artistic documentation of the original Advanced Series offered with love and respect for this beautiful system of yoga and to its teacher, K. Pattabhi Jois. The video features David Swenson, Helena Berg, Robert Boustany, Lucy Martorella and David Williams. Note: This is a NON-INSTRUCTIONAL video. It is an artistic production meant for entertainment and historic documentation ONLY. The yoga practice portrayed in this video is extremely advanced and should not be attempted to be performed or practiced from this video. The creators, producers, participants and distributors of this program disclaim any liabilities or loss in connection with the utilization of this video for any purpose other than entertainment or historic reference.